As a VBA application developer, you may use the SaveToDB add-in in your projects. You may easily load data from database tables, views, stored procedures, from the web and text files. You may easily save data changes back to Microsoft SQL Server, Oracle Database, IBM DB2, MySQL, MariaDB and NuoDB databases. 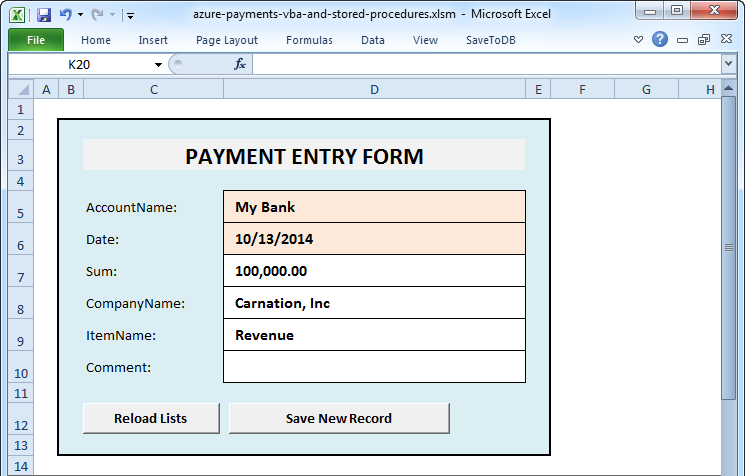 Implement loading Account, Company and Item lists into Excel to validate input. The first and the third tasks are not complicated. But the second task is not so easy, especially when the project is deployed on multiple computers or the database connection requires installing ODBC drivers or OLEDB providers. The SaveToDB add-in solves such issues. Load data into an Excel table. Configure saving changes from Excel to a database using SaveToDB features. Add a row to Excel table and copy form values into the new row. Call the Save method of the SaveToDB add-in. Save data directly into database tables. Save data using stored procedures. The first way is much easier but has security issues as users can update the table. The second way requires additional efforts but solves all security issues completely. Also, you may implement any business logic in stored procedures on the server side, not in macros. You may use Connection Wizard to connect tables, views, and stored procedures. And you may save data back to a database using the Save button. 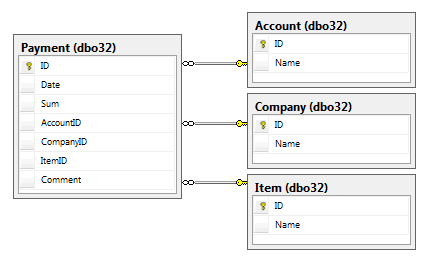 You may see and change active database object using the Query List. You may change query parameters using the ribbon parameters or named cells. When the table is connected and supports saving changes, you may use the Save method in your VBA code. You may easily filter data loaded from a database in your VBA macros. The SaveToDB add-in places stored procedure parameters to the ribbon automatically. For tables and views, you may select fields to place to the ribbon and change the WHERE clause values. You will find the described example in the package. You may also download the SaveToDB SDK. Use the SaveToDB add-in in your VBA applications. And feel free to contact us.